ULMA Inoxtruck designs and manufactures material handling equipment for clean rooms. They supply innovative solutions for the food industry as well as the pharmaceutical, medical, microelectronics and aeronautic clean rooms. ULMA Inoxtruck produces material handling equipment following the guidelines of hygienic designs that are required by the Good Manufacturing Practices (GMP) for the processing and packaging lines. 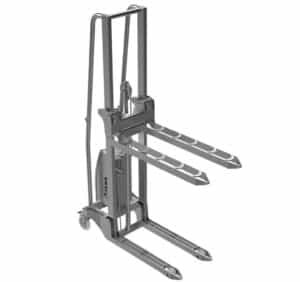 The MPT 2013 Series hand pallet trucks are specially designed to handle fish, dairy product, meat, fruit and vegetable in aggressive environments in the food and agricultural sector guaranteeing strict hygiene compliance in this highly demanding area. 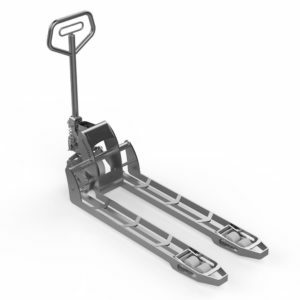 The ULMA Inoxtruck 100% stainless steel electronic pedestrian pallet truck provides innovative and hygienic design, ideal for fish, dairy product, meat, fruit and vegetable in aggressive environments in the food and agricultural sector guaranteeing strict hygiene compliance in this highly demanding area. 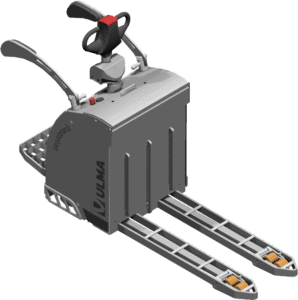 ULMA Inoxtruck electric scissor highlifter offers an innovative design to improve the ergonomics in the handle of fish, dairy product, meat, fruit and vegetables and the load keep always to the suitable height to collect/deposit them and reducing the effort. 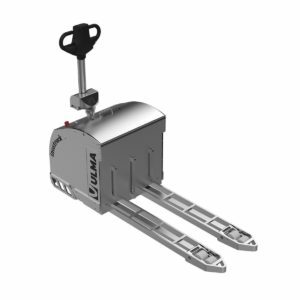 The ULMA Inoxtruck 100% stainless steel electronic paltform pallet truck provides innovative and hygienic design, ideal for fish, dairy product, meat, fruit and vegetable in aggressive environments in the food and agricultural sector guaranteeing strict hygiene compliance in this highly demanding area. ULMA Inoxtruck electronic pedestrian electronic stacker provides a hygienic and innovative design, solving all needs for the stacking and the storage of fish, dairy product, meat, fruit and vegetable at different heights. 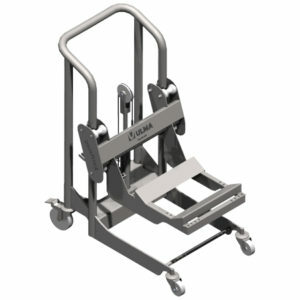 These 100% stainless steel electronic stackers offer a residual load capacity at maximum height. Cleanrooms are environments of low temperatures and high humidity, therefore the manual handling of loads is a hard job that may cause possible injury. 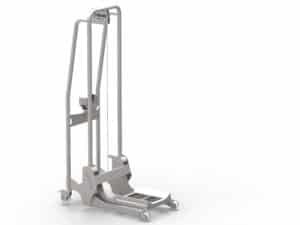 The 100% stainless steel and cleanable manual Mini-Load Stacker ULMA Inoxtruck, solves this problem, enabling ergonomic and easy handling meat, fish, dairy product, fruit and vegetable. 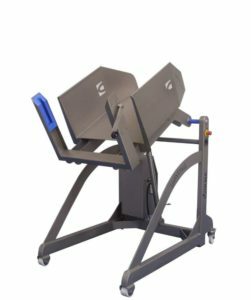 The 100% cleanable Electromanual Mini Load stackers with electric lifting system are designed to handle rolls, boxes, tilting attachments or other implements in production clean rooms and packaging lines of meat, fish, dairy, fruit and vegetable. 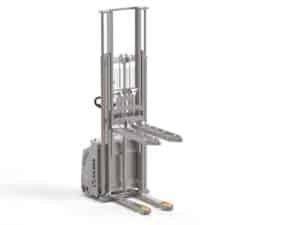 The 100% cleanable Electromanual Maxi Load stackers with electric lifting system are designed to handle rolls, boxes, tilting attachments or other implements in production clean rooms and packaging lines of meat, fish, dairy, fruit and vegetable. 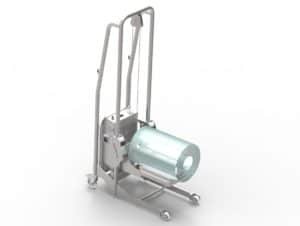 This innovative trolley has been designed and manufactured by ULMA Inoxtruck to make the hard task of replacing the film rolls of the machines for wrapping/packaging meat, fish, dairy product, fruit and vegetable. 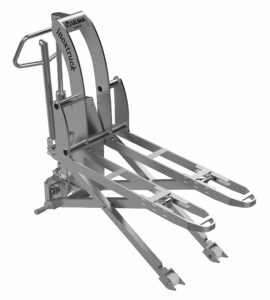 ULMA Inoxtruck EBT10 tilters allow an ergonomic handling/casting of loads, thanks to the tilting system of 85º and 105º. 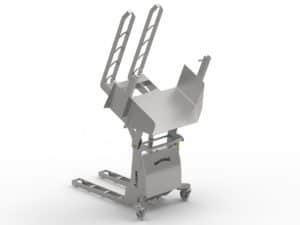 These models have an innovative design that makes possible an ergonomic handling/tilting to conveyor belt or other containers of products of fish, dairy, meat, fruit and vegetable industry reducing efforts. The ULMA lnoxtruck tilters, specially designed for the industry of seafood, meat, vegetables and dairy products are mobile models developed for effective turning /casting of containers, euro bins and drums to conveyor belts or working tables. Al Thika Packaging is the exclusive distributor of ULMA Inoxtruck in the Middle East. Since 1994 Al Thika Packaging has been supplying hygienic equipment (Hand Pallet Truck, Electric Scissor Highlifter, Electric Pedestrian Pallet Truck, Electric Platform Pallet Truck, Electronic Pedestrian Stacker, Manual Stacker Mini-Load and Bottom Roll Trolley) for food and pharmaceuticals in Dubai, Abu Dhabi, Sharjah, Fujairah, Ras Al Khaimah, Ajman, Umm Al Quwain, Al Ain – UAE, Saudi Arabia, Bahrain, Oman and the many other Gulf countries.